The Secretary of State reports 590,895 votes counted late Thursday, with a 5,131-vote advantage for Phil Weiser in his race with Joe Salazar. The estimate is that the final vote total will be about 600,000 (currently 627,839 counted in governor’s race, which usually gets more than an AG race). Assuming there are 11,000 more votes to count (at most), Salazar will need 73 percent of the final vote, or 8,100 out of the 11,000 to be 5,200 votes ahead of Weiser (Weiser would get 2,900). Possible, but unlikely. Record Primary Turnout. Democrats Dominate With Unaffiliated Help. A record voter turnout fueled by 291,000 unaffiliated voters set the stage for an expensive, negative battle to November. Republicans were pleased that Jared Polis is the Democratic nominee. In their view, he’s the most vulnerable. But, Democrats were ecstatic to see the heavy Democratic voter turnout and huge supply of unaffiliated voters. Although final numbers won’t be available for several days, the Secretary of State reported 1,174,000 votes total. Democrats attracted 119,000 more voters than Republicans, and importantly, 65,000 more unaffiliated voters. A nice advantage to start a general election. Progressives Taking Control of Democratic Party? Nationally, the contest for the House and in the states in November increasingly appears to be between the progressive wing of the Democratic Party and Trump supporters. It’s somewhat deceptive. Although Bernie Sanders progressives have won some high-profile victories, such as Alexandria Ocasio-Cortez in New York, Democratic incumbents are mostly going back to Congress and establishment-favored candidates have won the bulk of primaries. Colorado also had a split result with the most progressive and anti-establishment gubernatorial candidate, Jared Polis, winning his primary, but Diana DeGette (1st CD) is returning to Congress after a progressive challenge and more establishment candidates Joe Neguse (2nd CD), Jason Crow (6th CD), Dave Young (Treasurer) and Phil Weiser (AG) all winning contested primaries. Will Polis’s progressive image and agenda help Democrats take control of Colorado’s constitutional office and the State Senate or put them on the defensive? Working with the 9News team, as I have since the 1988 presidential election, we were able to call the primary races last night in the first 40 minutes. The campaigns and other news outlets tend to follow 9KUSA’s calls of the elections. Primary voting is up and a record number of unaffiliated voters have participated. The 2018 primary election is making history. Both parties are having tough primaries that could produce a major shift in the direction of state government. Highlighting the importance of the gubernatorial primaries is the record expenditure. As of early June, $35 million had been spent. 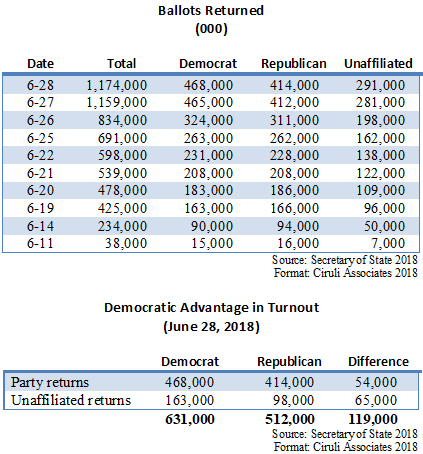 Turnout is up, well over 800,000 voters and approaching one million, and more than 200,000 will be unaffiliated voters – new participants in the primary process, a major change to the politics of the state’s nominating system. President Donald Trump has decided that hard-right rhetoric with no compromise on immigration will be a winner in the midterm elections. It is a bold and risky strategy, but it is in alignment with Trump’s views and his political strategy from the day he announced in June 2015. Mexican immigrants and a wall launched his drive for the Republican nomination and it immediately gave him 15 percent of the vote – a strong spot in the early running. It was his call to ban Muslims that catapulted him to the front of the field in December just as the primaries started. Immigration has also produced the administration’s greatest controversies, from the travel ban the second weekend in office, to the family separation policy after 520 days in office. But, he has never wavered in harsh language and tough politics. Steve Bannon, jettisoned from the White House but always happy to gather some attention for his ethno nationalist theories, points to the growing impact of immigration on western democracies (today, it’s leading to a crisis in Germany) and its contribution to the rise of populism and nationalism in Poland, Hungary and Italy. Steve Miller, Trump’s domestic policy enforcer on immigration, argues there is much upside on the hardline position and little downside. The zero-tolerance stance is red meat for the base and supported by super majorities of Republicans, and it cuts off the potential critics like Laura Ingraham, Rush Limbaugh and Breitbart. Specifically, Trump’s adoption of hard-right policies has the midterm advantage of exploiting the two facts that have most empowered Trump in the age of polarization: hostility to the “other” and attacks on the “messenger.” Trump expertly keeps what aggravates his base front and center: Democrats, immigrants, Hillary Clinton and Maxine Waters. In today’s political climate, people are not attracted to vote for positive reasons, such as tax cuts or deregulation, but negative reasons – to fight the other side, the other people and the unknown. The media is at the bottom of the pyramid of respect for institutions. Its focus on the sympathetic aspects of the border crisis makes it a useful foil for the President and his allies. Will his strategy hold the House and win some seats in the Senate? Trump calls it the “Red Wave.” It’s going to be a long and ugly campaign. The latest year-to-date sales tax revenue for local and state government in the seven-county metro area is up the first four months of the year, 6.1 percent over 2017. One-cent of sales tax revenue produces $190 million. A growing population and vibrant economy continues to produce significant sales tax revenue increases. The rate of ballots processed this week has been about 50,000 to 60,000 a day. At that rate, the final total should exceed 800,000 votes by Tuesday. Final ballot chasing by the campaigns and the sudden realization by procrastinators that time is up may produce a final surge. Also, expect 200,000 unaffiliated votes. If It’s Stapleton vs. Polis, Who Wins? A recent poll from Service Employees International Union conducted by Strategies 360 claims that in a race between the party’s respective frontrunners – Walker Stapleton and Jared Polis – Polis, the Democrat, would win by 5 points. It also reinforced earlier polls that Polis is ahead of Cary Kennedy by more than 10 points. General election polls more than four months before an election are highly unreliable, but it does reflect the view that Colorado Democrats have a generic advantage just based on shifting partisanship and recent voting behavior – namely, Hillary Clinton’s 5 point win in 2016. But, that advantage depends on a base of voters turning out and the large bloc of less committed, weak partisans and unaffiliated voters being attracted to, or at least not put off by, the Democratic candidate. As Cory Gardner highlighted, Republicans can win statewide even against well-funded incumbents. What are some of the factors that will define the race? In a parallel commentary, Alan Salazar, the Democrats’ top strategist, a person who has boosted the careers of Udall, Hickenlooper and now Hancock, sees the Trump factor the greatest asset promoting Democrats, especially motivating the base, but also providing regular controversies that will put Republicans in an explaining posture. Salazar is correct that Trump was not only unpopular in Colorado in 2016, but recent polls reinforce that beyond committed Republicans and some blue collar conservatives, he continues to lack appeal to Colorado’s swing voters, critical in the state’s general election. Considering party positioning and the 2018 environment, it appears that Colorado Democrats have a slight, but fragile, advantage. Although the state has shifted to the left, the Democratic ticket may be even more to the left. The Blue Wave may be strong in November, but Democrats have a poor record of turnout in non-presidential elections. This analysis did not consider the candidates or their campaigns. I predict July and August will rapidly highlight the strengths and weaknesses of the two candidates and their ability to construct campaign organizations. This is a major political transition for Colorado, and both local and national media and interest groups have a powerful stake in the outcome – they will be watching. The biggest story in this primary election is money. The Denver Post reports $24.6 million in spending by the eight gubernatorial candidates. In April of last year, The Buzz predicted a $25 million primary. I had some candidates who dropped out or never announced on the list (Ed Perlmutter, Jack Graham, Kent Thiry), but Jared Polis, Mike Johnston, Vic Mitchell and Walker Stapleton were all listed as likely multi-million dollar fundraisers. Expect the final figure to get to $30 million. The $25 million is just personal contributions. Another $10 million is recorded as PAC spending. 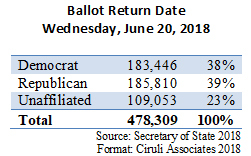 Of the more than 478,000 ballots returned and received by the close of Tuesday, June 19 (one week before the June 26 election), 23 percent, or about 109,000, were from unaffiliated voters. Polls and pundits had expected 15 to 20 percent would be the ultimate unaffiliated share of the total vote. 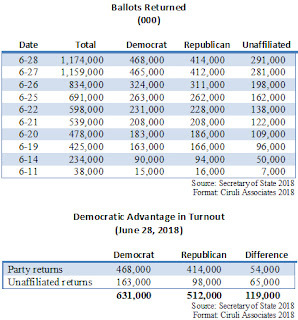 That means if the total vote is above the 645,000 the Secretary of State reported voted in the 2016 primary and it could get close to one million, approximately 150,000 to 200,000 will be unaffiliated voters – a very significant number. Voters are overwhelmingly older (58% 61 years old or older) and more likely to be women (53%). 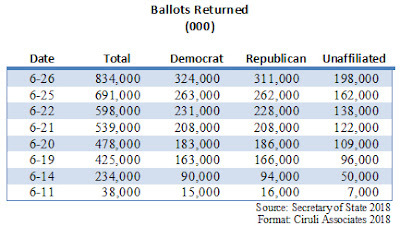 Eighty percent of the returns a week before the election are from the eleven largest counties, with El Paso, Arapahoe and Jefferson leading the pack. A few notable facts: Denver is lagging in early returns; Democratic returns are slightly ahead in both Arapahoe and Jefferson; and large numbers of Democratic ballots were used by unaffiliated in Arapahoe, Boulder, Jefferson and Larimer. A number of factors have slipped the Republican Party into third place in Colorado in presidential performance. George W. Bush won the state by 8 points in 2000 and Donald Trump lost it by 5 in 2016. That 13-point swing wasn’t just about the charisma of Barack Obama. Even the highly unpopular Hillary Clinton led the Democrats to a 5-point win. Because of recent growth, the power driver of the state has become the metro area, and Trump was crushed in metro Denver. He lost all the large counties, except Douglas. He lost Arapahoe County by 14 points and Jefferson by 7 points. Denver, the dominant population center, gave Hillary Clinton 74 percent, or a 55-point deficit for Trump. A comparison between the Republican Party’s strength in the 2000 presidential election by county shows the swing from Bush to Trump in 2016. 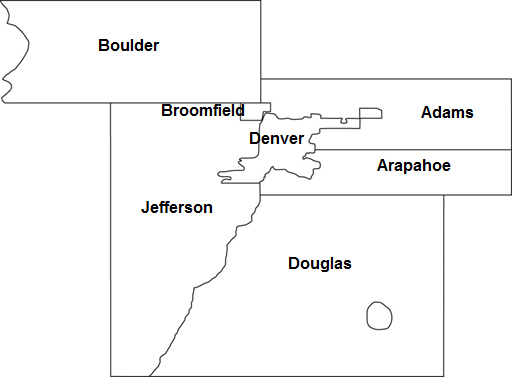 Bush carried Arapahoe and Jefferson counties, and comparing 2000 to 2016, Republicans performed 12 points better in 2000 in Arapahoe and 9 points better in Jefferson. Bush lost Boulder and Denver, but managed to get into the “thirties,” or more than 10 points above Trump’s total in each. In more blue collar Adams, Trump was only 3 points behind Bush. Although Trump won Douglas, he trailed Bush’s 2000 win by 10 points. Judy and her partner, Taffy Lee, were great friends of the Scientific and Cultural Facilities District (SCFD). They helped with several campaigns of Ciruli Associates in the 1990s. 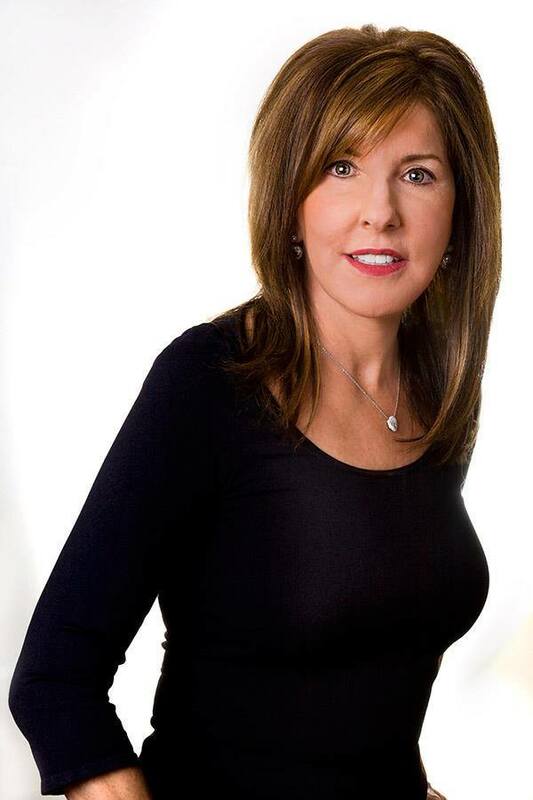 Judy became a style editor for the Rocky Mountain News and the Colorado Statesman. She was a big hugger, a tremendously positive force in people’s lives. Colorado’s rapid growth is one of the major influences affecting Colorado’s politics. 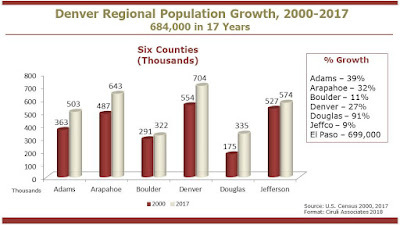 The state’s county commissioners recently heard a presentation at their annual Colorado Counties Inc. conference that included a slide about the growth in the Denver metro area since 2000. The PowerPoint slide shown below presents the growth in the six largest metro counties from 2000 to 2017, the most recent census data. 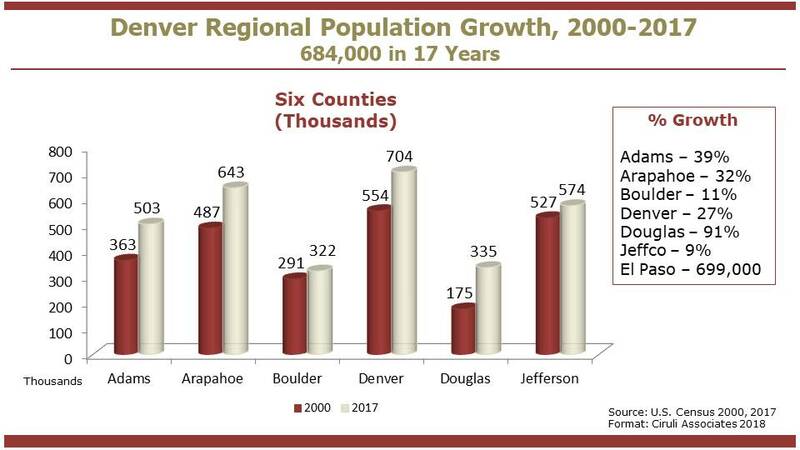 Colorado’s population has grown from 4.3 million in 2000 to 5.6 million today, or a 30 percent increase. More than half that growth has been in the six-county metro area, which jumped 684,000 residents from 2.4 million to 3.1 million. Arapahoe County’s 32 percent growth moves it from the 3rd largest county to second, behind Denver (704,000) and third statewide behind El Paso (699,000). Boulder and Jefferson counties are the metro laggards with 11% and 9% growth, respectively. Boulder dropped to the smallest population in the six-county metro area behind Douglas. Jefferson added only 47,000 new residents. Denver’s addition of 150,000 new residents has been extraordinary, especially in the last 7 years. It has changed the politics of the metro area (more Democratic) and made growth a political issue in Denver (traffic, density, gentrification, stress on city services and facilities). Adams and Douglas counties, the north and south counties on the metro Front Range, have the fastest growth rates and still have room for considerable growth. 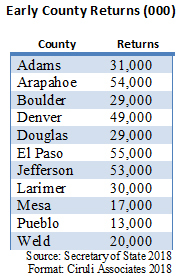 Note: Broomfield wasn’t a county in 2000 and would increase the current total metro population by about 50,000. Millennial voters are flooding into the electorate and will after 2020 be a greater voting bloc than the all-powerful Baby Boomers who have so long dominated. They are more liberal and their full cohort of 75 million will be voting age if they choose to vote. One reason there is doubt as to the Democrats’ blue wave this November is because the young Millennials may sit out 2018 to wait for a more interesting or inspiring presidential election. But, Millennials are already having impact. A new wave of under 40-year-old leaders in democracies and dictatorships are shaking up the system. In 2014, when the University of Denver (DU) selected Rebecca Chopp as its first female chancellor, she inherited a school with good bones, but lacking an updated vision. Now with its Campus Framework, it has a sense of direction, and the good news for Denver is that it includes an extensive neighborhood plan. 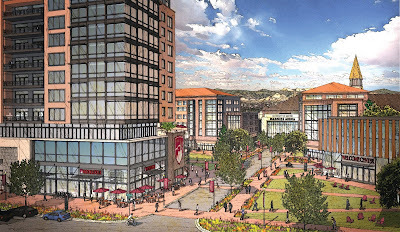 The new framework includes linkage with Denver’s mass transit, softening the edges of the campus for neighborhood connections, enhancing housing (students stay in campus housing longer today), and making DU more commercially vibrant with stores and dining found in Denver’s most robust retail centers. 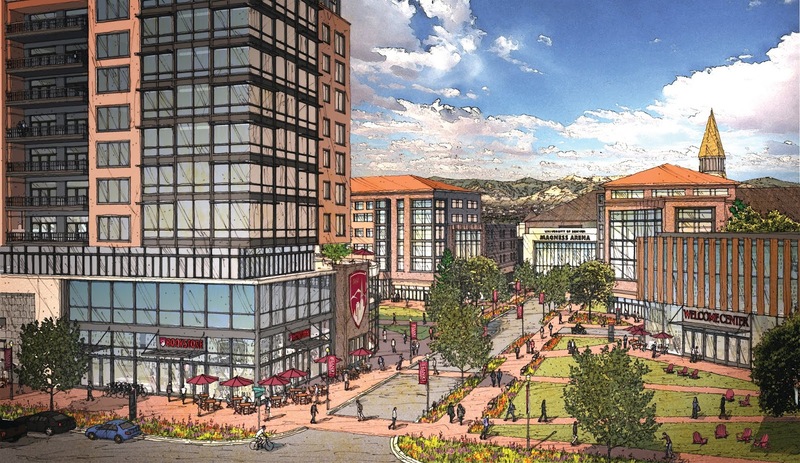 The plan sees DU and its 125-acre campus as a college town in the heart of the city. Blue Wave or Just a Ripple? 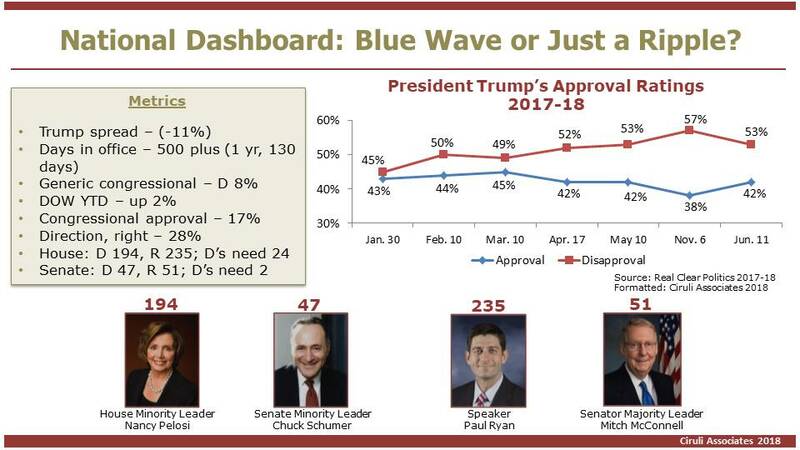 The recent primaries and national dashboard are sending mixed messages on the blue wave. The presumption, based on history, has been that Democrats should be able to pick up at least the 24 seats they need to retake the House and get the Speaker’s gavel back. And although President Trump’s approval rating remains historically low, it has improved from last fall when it was at 38 percent (negative 18%). In addition, the generic congressional spread, which was double-digits in favor for the Democrats last fall, is now 8 points and has been as low as 3 in the last thirty days. The general sense is that the political environment that so favored the Democrats the last year has shifted to a more neutral position, still favoring the Democrats, but offering them less comfort. 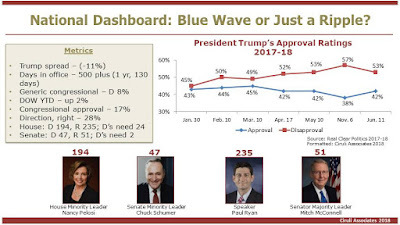 Possibly the best recent poll was conducted by Anthony Salvanto and his team at CBS who are polling in 64 competitive or likely competitive congressional districts. Their latest survey showed the Democrats winning 219 seats, one more than needed to win the House (of course, there is a margin of error). Republicans liked the economy and disliked immigration. Democrats worried about health care and disliked Trump. The most recent primaries also offered ambiguous signs for Democrats. Although Democrats avoid a lockout in several California congressional districts, in 5 out of 7 they received less than 50 percent of the primary vote, increasing a likely tough race in the November general election. The conclusion of this analysis is that, as of June 1, Democrats have some modest advantage based on the historical precedence of voters wanting to reign in a new presidency and a highly polarizing chief executive, but the battle for the House will mostly be waged seat by seat. Colorado in recent years has been attempting to limit the volume of initiatives going to ballot, especially changes in the state constitution. In 2016, voters passed Amendment 71, which requires a super majority for constitutional amendments (55%) and signatures to be collected throughout the state. But, Amendment 71 has not slowed a mass of initiatives from being filed or heading to signature efforts (98,492 required in 2018). More than 150 initiatives were filed in 2018, and as of June 1, the legislature put six constitutional amendments on the ballot and at least six more, including several constitutional amendments, are seeking signatures. Most of the initiatives in circulation are statutory to avoid the new constitutional rule of super majority. Proponents assume future legislatures that might have majorities opposed to the initiative will be reluctant to repeal or modify it due to voter majorities have passed it. Only two of the legislative initiatives are important and have significant support. They will create commissions to design new congressional and state legislative seats post the U.S. Census (Amendments Y and Z). Reapportionment legislative referrals good chance of passage. Well financed, broad support. Parties seem quiet (Amendments Y and Z constitutional). Bonds for transportation, sales tax increases. Denver Chamber leads a civic consortium, but already has significant opposition in El Paso County (Initiative 158 statutory). Competing measure to use existing revenue for roads (Caldera’s Fix Our Damn Roads, Initiative 167 statutory). Complex income/property tax charge for more K-12 money. Early opposition due to complexity. Similar measure lost huge three years ago (Amendment 93 constitutional). Limits on growth. Very controversial, major opposition (not in circulation as of June 1). Proponents quiet as opposition money is assembled. Severance tax for various causes (not in circulation yet) and minimum distance for drilling (Initiative 97 statutory). Major opposition from gas and oil. Minimum support from Democrats. Taking of property for public use (Initiative 108 constitutional). Opposed by most local government and economic interests. Anti-sanctuary laws for immigration (Initiative 169 constitutional). Very controversial topic in governor’s election. The Trump rally, which began in November 2016, is over. 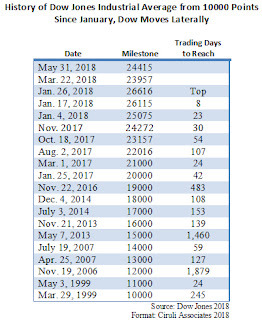 The Dow hit its top on January 26, 2018 at 26616 and is now down more than 1400 points, with a year-to-date loss at the end of May of one percent. The Dow Jones Industrial average began its decline as volatility increased. Two hundred-point daily fluctuations have become common. It hit a low of 23957 on March 22, and climbed back to 24415 by the end of May. But few expect the gains of the last year and a half to resume. Trade wars and problems in Europe join the volatility of the White House to roil the market in spite of job growth, tax cuts, positive earnings reports and deregulation. Trump’s anti-establishment, anti-immigrant positions have encouraged Italian and other anti-EU, ethno nationalists. The administration’s pro tariff and combative foreign policy has alienated old allies and emboldened new adversaries. Beyond the politics, there is a sense the long boom is ending, interest rates are climbing and a recession is looming. Civic activists, Arlene and Barry Hirschfeld, just received the prestigious Bonfils-Stanton Foundation award for community service. Their years of service in the Denver community span a variety of charities and causes, but it was culture, a Bonfils-Stanton focus, that got the most attention. Arlene has been one of the chief fundraisers for the Denver Art Museum’s decades-long building program, including the Hamilton Building and now the new Ponti improvements. 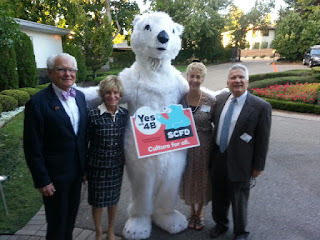 Barry was one of the founders of the Scientific and Cultural Facilities District (SCFD) in the mid-1980s and has been a supporter ever since. The District first voted on in 1988 was just renewed by voters in 2016 by a 63 percent majority in the seven-county metro area. Arlene and Barry hosted a campaign and fundraising event at their beautiful home. Barry was one of the metro area’s first leaders to understand the importance of culture to tourism and the local economy. Thank you Arlene and Barry for your leadership.